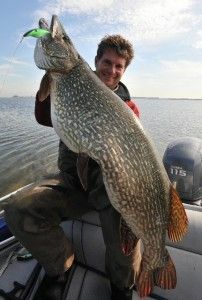 CL Fishin - Serious About Big! May’s box has arrived and it is another shipment packed with useful items for the avid bass angler. 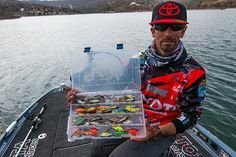 This month’s box features more baits that are timed just right for spawn/ post spawn bass. The baits will come in handy for anglers no matter what stage bass are currently in down in your neck of the woods. The first bait, and admittedly, the one that excited me the most was the River 2 Sea Biggie Poppa 67. I got the Bumpin’ Rattle model which is a fast floater in S45 (blue gill). This hardbait is designed specifically with Bassmaster Elite Ish Monroe in mind and features a great realistic finish, River 2 Sea’s short shank treble hooks, and Tungsten weight system with rattles. I can’t say enough good things about the finish on this bait. 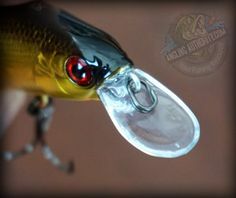 The detail is amazing as well as the belly of the bait, which is a great feature, especially if you consider that bass will usually look at a bait from below. This bait will dive 3 to 5-ft with the smaller “smalls” model running shallower at 2 to 4-ft. In clear water, which I am usually fishing, this crankbait is going to be dynamite! 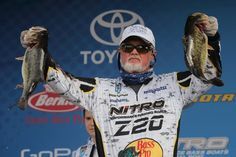 I can see it absolutely dominating in areas where bass are relating to stumps and laydowns. The square bill on this bait and blue gill pattern will do well in lakes where bass feed on them, which is a lot of lakes! MSRP on this hardbait is $8.91 USD, so this month’s box is already looking great! Read on to see what else Tacklegrab sent us! With bass still on beds in the northern latitudes, the lizard is still a viable option for anglers in May. The ZMan lizards we received are perfect for dragging near spawning beds and also for slow Carolina rig presentations in the summer. We received green pumpkin/ red flake color lizards. MSRP on this item is $5.49 for a 6 pack of lizards. The Fishbelly Bushido Blade lures were really interesting. I was dissapointed that there were only 3 in the pack. Catch a few fish and these will be gone in no time! That having been said, these baits were super cool! I loved the detail on the baits and can see why they are priced what they are. They come in 3.5″ and 5″ versions. I was sent two different designs and colors as shown above. The black/silver bait is almost like a fluke style soft jerkbait while the smaller shad with the cut-tail seems to be a swimbait. 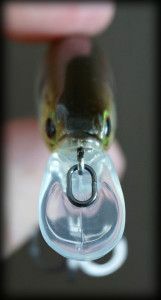 I would use the fork-tail bait as either a weightless jerkbait, Texas-rigged thrown around weedlines or small pockets in cover. 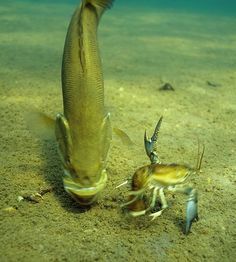 This bait may work even as a power dropshot bait thrown around cover. The large profile would definitely work for largemouth bass around docks or boathouses. The Bushido Shad with the swimming tail would work well with a screw-lock hook and swam around weedlines. The tail makes it ideal in my mind for a fast moving swimbait. I think burning it with a 3/8 swimbait hook would get reaction strikes, especially over thick weedbeds. The last bait that was in our TackleGrab box for May is the Secret Lures MVP finesse jig. Retailing for $3.59 this little jig has all the features you would expect; Mustad hook, flat-eye design and recessed line tie, Secret Lures “pivot divot” to rock the jig back and forth. We were sent a green pumpkin jig/purple flake in 3/8-oz. As any angler will tell you, jigs are a keystone of bass fishing, so another jig is always welcome. May’s box gives anglers an opportunity to try a brand they may not know about, or never considered before. There you have it folks; some very good choices from TackleGrab! If you are interested in trying out baits you’ve never seen before, or you are just curious about new techniques, then TackleGrab may be something you want to consider!